On February 15, the Estonian Music Week Team introduced the exciting upcoming festival taking place from May 24-29, 2018 in Toronto. This extraordinary festival will feature artists from Estonia collaborating with Canadian artists to celebrate the Republic of Estonia's Centennial. EMW is the first of its kind to take place in North America. From left to right: Linda Litwack (Public Relations), Tom Treumuth (EMW Artistic Director), Viive Sarv (EMW Team), Jaan Kittask (Graphic Designer), sitting Kati Kiilaspea (EMW Team), Marika Mayfield (EMW Team), Max Rubino (21C Festival, the Royal Conservatory of Music), Anne Remmel (EMW Team), Kaili Kinnon (EMW artist), Heather Kelly (Bloor St. Culture Corridor Founder, RCM), Matthew Moore (RCM). In front: Piret Noorhani (EMW Festival Coordinator), Reet Lindau-Voksepp (EMW Team). Foto: Taavi Tamtik (2018) On the evening of February 15th, the launch for Estonian Music Week 2018 took place. 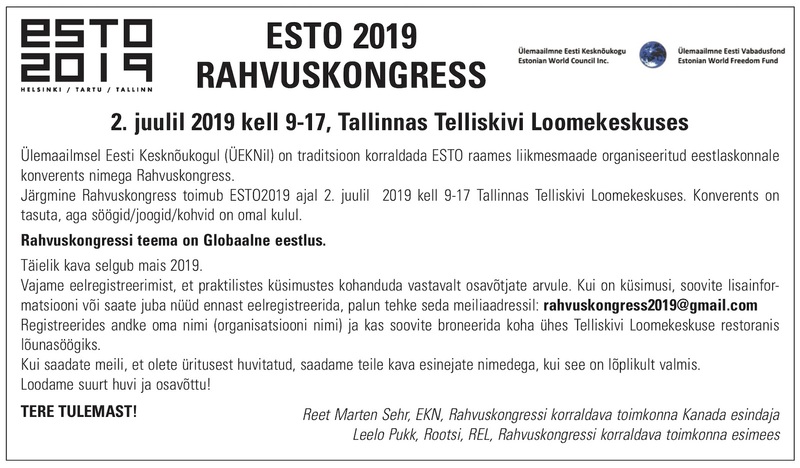 This was a chance to introduce the festival, its theme and the musicians taking part to both our own Estonian community and to various media outlets. Amongst the guests were renowned freelance arts journalist Kerry Doole, David Perlman, editor and publisher of the local WholeNote magazine, and Bill Watt, from the monthly paper Hi-Rise. The programme for the night was energetically led by the festival coordinator Piret Noorhani, who brought a copious amount of information to the public with a lot of style. Jaan Meri said a few words on behalf of Tartu College and the Estonian Studies Centre, which is one of the main sponsors of the festival. The artistic director of Estonian Music Week, Toomas Treumuth, had the pleasure of formally introducing all of the fabulous artists included in the festival. Just to name a few: Vox Clamantis, Maarja Nuut, Estonian Voices, Kara-Lis Coverdale, Kristjan Randalu… Observing the public, it seemed that these musicians and ensembles had successfully caught the attention and piqued the interest of many. After the introductions, we heard from Max Rubino, programming manager at the Royal Conservatory of Music, and from Heather Kelly, founder and director of the Bloor Street Culture Corridor. Both speakers gave their blessings and well wishes for the festival on behalf of two major institutions that the festival is in partnership with. The nature of the partnership is that the Vox Clamantis and Maarja Nuut and HH concert on the eve of May 26th is a part of the Royal Conservatory of Music’s 21 C Festival. Video greetings were also viewed from Virgo Sillamaa, the artistic director of the festival in Estonia and from Jorma Sarv, the international program director and official representative for EV100. 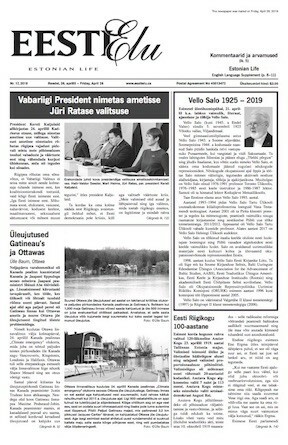 Both greetings were done in a lighthearted, fun manner while also stressing the importance of this festival in forging a stronger connection between Estonia and Canada culturally. Along with Estonian Studies Centre, EV100 is the second major sponsor of Estonian Music Week. With this, the formal part of the evening’s programme came to an end and people were left to mingle and talk amongst themselves. Kaili Kinnon, one of the musicians featured in the festival, provided a soulful and beautiful sneak peek at the level of musical talent that is to be expected throughout the week of the festival. Her charming personality and unique voice brought the night to a close with a mystic musical experience and great atmosphere. 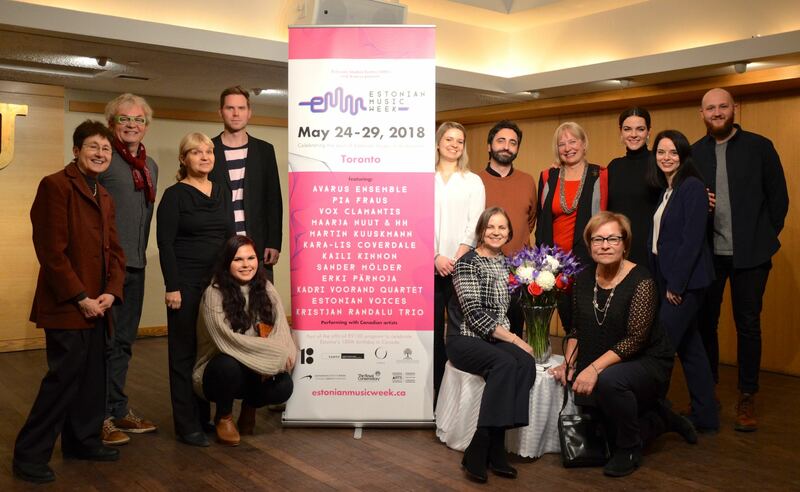 The festival team would like to thank the rest of our great sponsors: Estonian Credit Union, Estonian Foundation of Canada, and Toronto Arts Council. Tickets for the festival go on sale this upcoming Saturday, February 24th and will be available for purchase online through www.estonianmusicweek.ca/tickets/, Estonian Credit Union, and Tartu College Rental Office. For the Vox Clamantis, Maarja Nuut and HH concert, tickets will be available on February 23rd through www.rcmusic.com/performance. Tickets for the concert at Hugh´s Room on May 27 will be available through http://hughsroomlive.com/. Stay tuned to social media, Eesti Elu, and www.estonianmusicweek.ca for the full schedule of the festival, artist and ensemble biographies, and upcoming information in the very near future!